Join the Tillamook Association for the Performing Arts for “Nights of Art – Music and Muse” April 12th through the 14th. Friday night TAPA will host local musical favorites Eric Sappington and Brenna Sage for individual sets, then on Saturday and Sunday you will be entertained with music by Jazz-i-tude and then a performance by Liz Cole. Eric, Brenna and Jazz-i-tude are frequently found performing at your favorite local venues. Eric is a singer/guitarist and will have some of his art on display. Brenna is a singer/pianist who has performed at TAPA in the past, most recently in her show Lulu is Back in Town. And Jazz-i-tude, fronted by Sydney Elliot is a local jazz combo favorite. Liz has performed locally for various benefit events (Lower Nehalem Land Trust, Food Roots, Rinehart Clinic, Nehalem Valley Historical Society). She appeared in the original solo play Lost Pioneer, which she developed with Mark Beach and Portland playwright Ellen West. The play, presented at TAPA in 2013, is based on the lives of three women who homesteaded in Tillamook County in the 1890s, and blends biographical data with historical imagination. Liz will present STORY TIME FOR GROWNUPS: Reigning Cats and Dogs. Who ARE these 4-legged creatures who run our households and hold our hearts in their paws? Liz Cole, an award-winning actor who calls Manzanita home, reads stories and poems about (and by!) cats and dogs, to share some of the ways our fur friends captivate and rule. A joyous feast for all animal lovers! 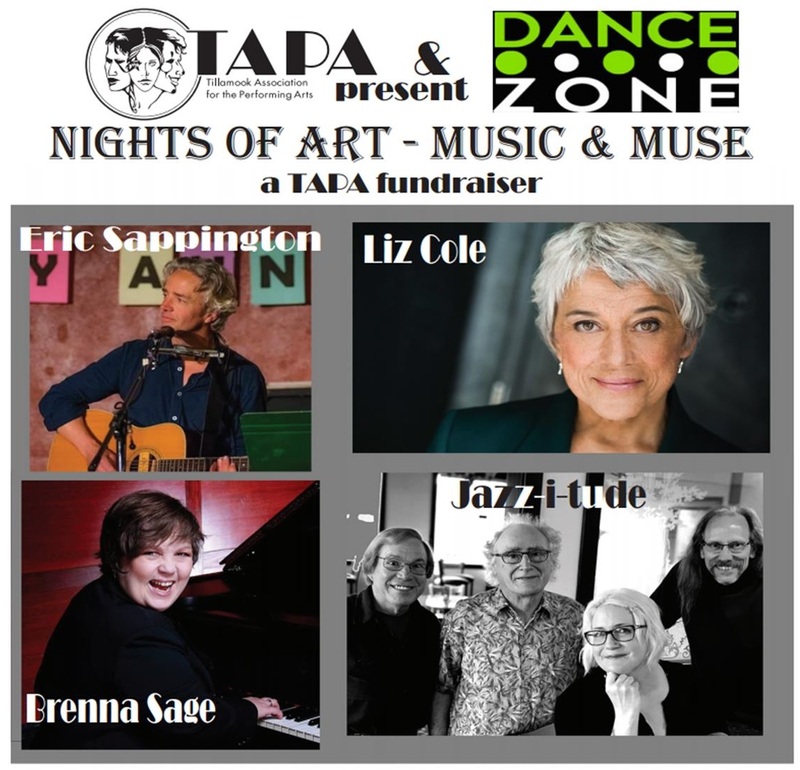 The Tillamook Association for the Performing Arts (TAPA), with sponsorship from DanceZone, present “Nights of Art – Music & Muse” April 12th through 14th at The Barn Community Playhouse in Tillamook. Join TAPA on April 12th and 13th at 7:00 pm and then on Sunday the 14th start at 2:00 pm. Tickets are $15 for each night and will be available at the door starting 30 mins prior to each show. Get information now on TAPA’s website, www.tillamooktheater.com, TAPA’s Facebook page or by calling 503-812-0275.